definitive guide to Irish hospitality. Georgina Campbell, the well-known food & travel writer, operates a small publishing company specialising in Irish food and hospitality. 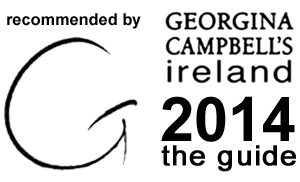 All Georgina Campbell Guides are based on the respected principle of independent assessment and publication of a guide selected entirely on merit. Georgina Campbell and her team of fellow food writers and other qualified hospitality professionals follow up with more anonymous visits, ultimately providing a comprehensive critical coverage for the entire country.